I’ve gotta tell you, I am SO done with winter! These Canadian winters are just awful. It’s always so cold, I never want to venture outdoors and it feels like it’s dark ALL THE TIME. The winter blues have been hitting me hard lately. And when I feel like crap it’s really easy for me to ditch my responsibilities and suddenly lose all of my good habits. Taking care of yourself and staying healthy takes effort! When I start taking the ‘easy’ way out and begin choosing processed convenience foods I only make myself feel worse. Luckily, my body has gotten really good at letting me know when it’s time to clean up my act. After a few days of eating too much junky, processed food I start to get intense cravings for huge amounts of healthy, nutrient dense foods. While I’m getting back on track I tend to crave nutritious things like smoothies, salads, and vegan lunch bowls. I love lunch bowls because you can seriously throw whatever the heck you want in there: leftover brown rice, quinoa, potatoes, and any kind of veggies, cooked or raw. When you’ve got leftovers, lunch bowls are quick, easy and very satisfying. What’s not to love? Well, unfortunately, if you don’t have leftovers on hand, putting together a lunch bowl can become a very long process. I can get disorganized really quickly so there have been a number of times where a lunch bowl craving has turned into me spending over an hour cooking. That’s what made me want to make a recipe for a quick, easy, from scratch lunch bowl. This roasted veggie quinoa bowl has 5 tasty components and only requires 30 minutes of your time! In this hearty roasted bowl we have: 1) Quinoa 2) Chili-lime kale 3) Garlic roasted broccoli 4) Curry roasted sweet potato rounds, and 5) Roasted soy sauce and sriracha chickpeas. All of that, in just 30 minutes. Roasting is the superstar of this recipe. The chickpeas, broccoli florets, and sweet potato rounds all take the same length of time to cook so we can put everything on the same pan. Every ingredient is perfectly cooked in 20 minutes! During that time you can simmer a pot of quinoa (15 minutes) and sauté some kale (less than 10 minutes) Easy! Assemble and enjoy. You can add toppings as you please. I prefer straight lime juice and red pepper flakes for this bowl but you could also go with hummus, avocado, guacamole, or sriracha. Each element is plenty flavourful on it’s own so feel free to go topping-less too! This recipe makes 2 servings so you get to share or save leftovers for work or school the next day. Prep your vegetables: chop broccoli into medium sized florets, destem and chop the kale, scrub and slice the sweet potato into ¼” wide rounds. Massage the broccoli florets with oil, garlic, salt and pepper - make sure to work the ingredients into the tops of the florets. Lay them in a row down the center third of a large baking sheet. Using the same bowl you mixed the broccoli in, combine chickpeas, oil, sriracha and soy sauce. Spread them out in a row next to the broccoli. In the same bowl combine the oil, curry powder, salt, and sriracha. Add the sliced sweet potato and toss to coat. Lay the rounds on the remaining third of the baking tray. Bake for 10 minutes. Flip the broccoli and sweet potatoes and redistribute the chickpeas to promote even cooking. Bake for another 8-12 minutes. Rinse and drain the quinoa. Add rinsed quinoa and vegetable broth to a small saucepan and bring to a boil over high heat. Turn the heat down to medium-low, cover and simmer for approx. 15 minutes. Once cooked, fluff with a fork and set aside. While the quinoa is simmering and the rest of the ingredients are roasting, preheat a large skillet with 1 tsp oil. Add the kale and cook for approx. 5 minutes, or until nearly tender. Add the salt, chili powder, and lime juice. Toss to coat and cook for another 2-3 minutes. Assemble the bowls: Scoop ½ to 1 cup of quinoa into each bowl, top with ½ of the broccoli, ½ the chickpeas, ½ kale, and ½ sweet potatoes. Feel free to keep everything separated in the bowl or mix it all together. Hi Katherine! I don’t calculate the nutritional value of my meals, my body is much better at knowing what it needs than my head is! You could put the ingredients into a nutritional calculator but I don’t think it would be very accurate. It’ll depend on things like the size of your sweet potato, how much quinoa you include, and how many servings you divide this recipe into. First of all, I LOVED LOVED LOVED this recipe! Thank you so much Brittany. This is the first recipe from this website I have tried and since making it I have printed off some more from your website and I am going to try them next. I am not vegan (yet haha) but I am trying hard to incorporate more vegetables into all my recipes. I especially love one bowl/dish recipes. I did a google search for veggie packed recipes and what caught my eye about this recipe were: one bowl, nutritionally rich, packed with veggies and ingredients I could easily find. p.s.The app also gives the micronutrient breakdown but I haven’t included everything in this reply. p.s. 3 servings sizes is based on the amount I personally can eat at one sitting before getting full. Perhaps for others it would be 2 servings. I have recently decided to transition to vegan and am finding it a little challenging to cook for myself (that was mostly my moms job – LOL) but this recipe looks simple and delicious! I am glad I found your blog! Sorry for possibly a silly question but do the chickpeas need to be left in a water overnight ? Hi! I used cooked, canned chickpeas for this so I didn’t have to worry about soaking them or anything. If you’re using dried beans, here are 2 resources: Soaking beans and how to cook dried beans. Glad someone asked this question – maybe you could edit your (amazing) recipe to note that the chickpeas should be cooked/canned. Thanks! I hear you about Canadian winters! 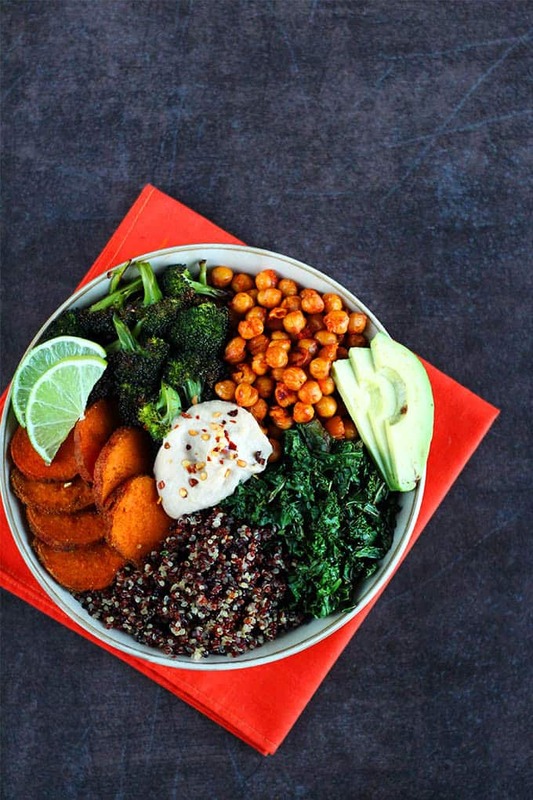 This lovely bowl looks very tasty and healthy, perfect for these dreary weeks ahead. Thanks Jennifer! I hope you’re hanging in there, just a few more months of winter! It really looks good and tasty! I just love kale, I can’t get enough in the summer time! You also have beautiful pictures! Girl I hear you! I’m in New England and I’m just SO over winter. We’ve got snow piles that are 20-30 feet at this point. It’s nuts. This bowl is gorgeous. I could eat this all day, every day! Oh my god, that sounds terrible! 20-30 feet?? I feel for you you!! Thanks for the lovely comment, I hope spring comes your way soon! I just came across your blog on Pinterest and absolutely LOVE it!!! Your pictures are incredible and I love your message!! Thanks! I traded rainy Vancouver winters for dark and cold Swedish winters, so I hear ya! I’m soooo ready for spring. This bowl looks like the perfect nourishing meal. It’s the second time I’ve seen roasted chickpeas today and now I’ve got a major hankering. Definitely going to make these for lunches next week. Thanks for the inspiration! Honestly, living in Sweden has destroyed my tolerance for rain and now if I’m ever back in Vancouver in the winter I’m FREEZING even at +5°C. I’ll take dry cold over rain any day! Haha, okay I guess we don’t see eye to eye on this one 😀 Alberta winters are SO DRY I’m starting to wonder if I’ll ever feel properly hydrated again! Looks great! One thing though, you mentioned leftover brown rice; I would advise against using leftover rice because a bacterium found on rice called Bacillus cereus can survive the cooking process and then when left at room temp or reheated later the bacteria develops from spores into the actual bacteria. Can give you a nasty case of food poisoning! Really! Great to know, thank you for your input 🙂 I’m gonna look into that asap! This was delicious. First time having kale or roasted chickpeas, loved them both! Also, I was never a fan of broccoli and now I realise I should have been roasting it with garlic all this time, super yummy! This was SO GOOD! I omitted the chickpeas as I didn’t have any, and doubled the kale. This was really easy and so yummy and filling! And it’s pretty to boot. 🙂 I’m new to your blog — love it! I’ve made this quite a bit over the past 2 months, and it’s fabulous! I love how easy and flavorful it is, and it gets my husbands’ approval as well. Thanks Jaime! I’m so glad you both enjoy this recipe! Yum, I made this last night for the first time….It was delish! Thank you for sharing. are the chickpeas uncooked ones? not the canned ones right? thanks a lot! Not only a delicious protein packed and delicious dinner, but a beautiful bowl! Just made this twice this month for work lunch and it’s been so great! I’m really enjoying this protein filled delicious meal 🙂 I was wondering if you could share the white sauce you’ve topped the bowl with in your pictures? I have been adding hot sauce (on top of sariracha) when I eat mine but I would love to try other options! Thanks for sharing! I never write reviews because I’m lazy but this was fanfreakingtastic. My boyfriend and I just moved out on our own recently and it’s bee struggle city but this recipe had everything we already had in the house and it was seriously tasty. Thank you so much! Okay, I LOVE you!! Thank you so much for taking the time to comment, it means the world to me. Also, I say “fanfreakingtastic” at least once a day so I think we should be friends 😛 THANK YOU!! Made this for dinner tonight and plan on eating the rest as leftovers throughout the week… SO yummy!! I think i cut my sweet potatoes too thick though because they’re a little crunchy, but that doesn’t bother me a bit. I’ll just remember to cut them thinner next time. Also was wondering how you make your chick peas crunchy? I left mine in the oven longer than the rest of the veggies, but alas… they weren’t crunchy ): still delicious though! Thanks so much for the healthy dinner! I tried this recipe for dinner (literally finished eating 20 minutes ago), and I had to rave about it. This bowl blew my mind. It was do easy to make and the flavours are phenomenal! Thanks so much Brittany. Clean, vegan eating never tasted so good! I just found your recipe via Pinterest and wow. This is delicious. Thank you for sharing! I made this recipe yesterday and packed up two servings for two lunches this week. This is such a lovely, healthy, filling lunch. It was easy and fast for me to make so this will be a regular for me. I have to bring my lunch to work every day due to dietary restrictions (gluten & dairy) so this recipe is perfect. I layered the ingredients in a mason jar to carry. So pretty! So glad you’re enjoying it Rita! What a great packed lunch! I made this tonight! There wasn’t any good looking kale when I went to the store so I tried substituting rainbow chard. That part flopped, but that may have more to do with my never having sauteed leafy greens before, and just not doing it right. Everything else was super tasty! I had an easy microwave pouch of brown rice and quinoa, so I just used that instead. Combined with the strategy of mixing the broccoli, chickpeas, and sweet potato in one pot, this was pretty darn easy! I did roast everything for almost twice as long as the recipe says, but I was expecting that because I know how long my oven tends to take for such a task. Everything was very flavorful, too. I’ve been roasting broccoli and sweet potato for awhile now, but the curry and chili powder on the sweet potatoes was a fun twist, and I will definitely be roasting more chickpeas from now on!My only wish is that I had some sort of sauce, as it was a tad dry. I don’t think I would have liked hummus on it, and it definitely didn’t need more sriracha or other spices, but maybe some sort of cool yogurt sauce? Something mild to balance the other flavors out. Overall this was a nice, fairly simple dish that I would make again with some slight modifications. Thanks for taking the time to write such a great review! I agree, a proper sauce would be a great addition, thanks for the idea! Thanks again Becca! I found your blog through Pinterest not too long ago, and I just made this recipe last night—oh my word, it was delicious and so easy to make! I’ll definitely be checking out more of recipes too! Thank you so much for sharing this! Wow, thanks so much Christine! I’m so glad you enjoyed this bowl! Mhmmmm i made this last night and i had the leftovers with me to work today! Again, great recipe, i love your blog! Thank you Janne! I agree, those chickpeas alone are perfect for snacking! SO glad you enjoyed the recipe and THANK YOU for commenting. I really appreciate it! Made this for dinner tonight, it turned out fantastic! The only thing different I did was to add some sauteed onion to the quinoa while it was cooking and toss it with coconut oil. Thank so much for the super easy recipe! I was surprised at how quickly it came together! Will definitely be making this again! Wondering what the white sauce in the recipe photo is! Hi Sandra! That’s just hummus on top. You could thin it out with vegetable broth for a proper “sauce” if you like. Made this tonight and it was delicious! My boyfriend’s half didn’t even make it to a bowl! He just ate the chickpeas and veggies like finger foods! Thanks for sharing such a quick and easy recipe! This was my first time making a veggie bowl like this and this recipe did not disappoint!! So simple to make and sooooo delicious!! Thanks!! Absolutely Splendid! I don’t think I’ve ever had such a tasty and delicious vegan meal! Thank you sooooo much for sharing this! My husband and I have been trying to cook more vegan/vegatarian and this meal is a KEEPER! Really yummy! Sliced the sweet potatoes too thick, whoops. A good meal to have post workout and have enough leftovers for lunch. I often find myself looking for healthy/hearty dinners to eat afterI’ve exercised and this is a keeper-thanks! This was delicious!! Loved it! Yay! I’m so glad! Thanks for commenting Jessica! Yum! Making this for dinner tomorrow night. I love a good bowl. I made your vegan goddess bowl recently and it was delish. An unrelated question, where did you get the labeler for your pantry jars? Old school and I love it. Thanks! Hi Mel! Ah! Thank you so much, I’m so glad you loved the goddess bowl! I think you’ll like this one too 🙂 A lot of people mentioned that this one would be good with a sauce. I usually use hummus thinned with vegetable broth but if you have leftover goddess dressing, it would be SO good on this bowl too! I use the DYMO Organizer XPress Labeller which I bought from Amazon. I love it SO much! I think the labels look so great. Would yoi 3at this cold for lunch the next day or reheat ?looks yunny! I’d be likely to eat it either way! This would be a great dish for eating cold, like a roasted veggie/quinoa salad, but reheating it would be perfect too! OMG – made the Roasted Veggie Quinoa Bowl and it was AMAZING! Will be making this often – so full of flavor! Thank you!